Gracias por participar para confimar tu inscripcion verifica en tu email. 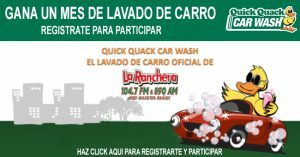 QUICK QUACK CARWASH CONTEST LLENA LA FORMA PARA LA OPORTUNIDAD DE GANAR UN MES DE LAVADO DE CARRO GRATIS DE QUICK QUACK CARWASH. IMPORTANTE CONFIRMAR TU INSCRIPCION EN TU EMAIL. 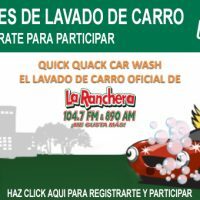 A PARTIR DEL MIERCOLES, 11 DE ABRIL DEL 2018 Y CONTINUANDO HASTA EL SABADO 9 DE MARZO DEL 2019 RADIO ESCUCHAS DE LA RANCHERA, MAYORES DE 18 AÑOS, TENDRÁN LA OPORTUNIDAD DE GANAR 5 LAVADOS DE VEHICULO NIVEL “CLEAN” DE QUICK QUACK CAR WASH EN EL AREA DE SACRAMENTO, CA. REGÍSTRESE Y CALIFIQUE: REGISTRE SU INFORMACIÓN BAJO LA PESTAÑA DEL CONCURSO. PREMIO: PREMIO DE TODAS LAS INSCRIPCIONES REGISTRADAS SE TOMARA DOS VECES AL MES Y SE SACARA UN GANADOR DEL PREMIO DE 5 LAVADOS DE VEHICULO NIVEL “CLEAN.” EL VALOR ESTIMADO DEL PREMIO ES DE $9.99 POR LAVADO DE VEHICULO CORTESIA DE QUICK QUACK CAR WASH CON FINES PROMOCIONALES. EL GANADOR SERÁ NOTIFICADO POR TELÉFONO Y / O CORREO ELECTRÓNICO. REGLAS ADICIONALES: SOLO PUEDE CALIFICAR UNA VEZ. NO ES NECESARIO NINGUNA COMPRA U OBLIGACIÓN. EL PREMIO NO ES TRANSFERIBLE. EL PREMIO GANADOR DEBE PROPORCIONAR UNA IDENTIFICACIÓN CON FOTO VÁLIDA DEL GOBIERNO DE ESTADOS UNIDOS. LOTUS SACRAMENTO CORP. NO ES RESPONSABLE DE LA CANCELACIÓN DE LA PERSONA GANADORA. EL GANADOR ES RESPONSABLE DE TODAS LAS OTRAS CUOTAS QUE PUEDAN SURGIR DE LA ACEPTACIÓN DEL PREMIO, INCLUIDOS TODOS LOS IMPUESTOS APLICABLES, INCLUIDOS LOS IMPUESTOS FEDERALES. LOS PARTICIPANTES ACUERDAN INDEMNIZAR Y SOSTENER INADECUADO LOTUS SACRAMENTO CORP. TODOS LOS PATROCINADORES PARTICIPANTES, SUS RESPECTIVOS AFILIADOS, DIRECTORES, OFICIALES, AGENTES, PERSONAL, ADMINISTRADORES, ASIGNA DE CUALQUIER Y TODA RESPONSABILIDAD, PÉRDIDA, COSTO, DAÑO, LESIÓN O MUERTE, INCLUIDOS LOS ABOGADOS HONORARIOS DERIVADOS, RELACIONADOS O EN CONEXIÓN CON PARTICIPACIÓN EN LA PROMOCIÓN / CONCURSO Y / O ACEPTACIÓN DEL PREMIO. LOS EMPLEADOS, AQUELLOS DOMICILADOS CON O LAS FAMILIAS INMEDIATAS DE EMPLEADOS DE LOTUS SACRAMENTO CORP. Y LOS PATROCINADORES PARTICIPANTES SON INELIGIBLES. LOTUS SACRAMENTO Y LOS PATROCINADORES PARTICIPANTES SE RESERVAN EL DERECHO DE USAR NOMBRAMIENTOS, VOZ E IMAGEN DE LOS GANADORES CON FINES PROMOCIONALES. UNA COPIA COMPLETA DE ESTAS REGLAS ESTÁ DISPONIBLE EN LOTUS SACRAMENTO, 1442 ETHAN WAY, SUITE 101, SACRAMENTO, CALIFORNIA DURANTE HORAS NORMALES DE NEGOCIOS. BEGINNING WEDNESDAY, APRIL 11, 2018 AND CONTINUING THROUGH SATURDAY, MARCH 9, 2019, LA RANCHERA LISTENERS, 18 OR OLDER, WILL HAVE THE CHANCE TO WIN 5 QUICK QUACK “CLEAN” LEVEL CARDS IN THE SACRAMENTO AREA STARTING APRIL 11TH, 2018. REGISTER & QUALIFY: VISIT LARANCHERA890.COM AND REGISTER YOUR INFORMATION UNDER THE CONTEST TAB. PRIZE DRAWING: ONE PRIZE WINNER FROM AMONG ALL REGISTERED ENTRIES WILL BE DRAWN AT RANDOM TWO TIMES A MONTH AND WILL WIN THE PRIZE OF 5 QUICK QUACK “CLEAN” LEVEL CAR WASHES. THE ESTIMATED VALUE OF THE PRIZE IS $9.99 PER CAR WASH PROVIDED BY QUICK QUACK CAR WASH FOR PROMOTIONAL PURPOSES. WINNER WILL BE NOTIFIED BY PHONE AND/OR EMAIL. ADDITIONAL RULES: YOU MAY ONLY QUALIFY ONCE. NO PURCHASE OR OBLIGATION NECESSARY. PRIZE IS NON-TRANSFERRABLE. GRAND PRIZE WINNER MUST PROVIDE A VALID U.S. GOVERNMENT ISSUED PHOTO ID. LOTUS SACRAMENTO CORP. IS NOT RESPONSIBLE FOR CANCELLATION OF THE CONTEST AS A RESULT OF THE OCCURRENCES OF EVENTS NOT WITHIN THE CONTROL OF LOTUS SACRAMENTO CORP. WINNER IS RESPONSIBLE FOR ALL OTHER FEES WHICH MAY ARISE FROM ACCEPTANCE OF THE PRIZE INCLUDING ALL APPLICABLE TAXES INCLUDING FEDERAL INCOME TAXES. ENTRANTS AGREE TO INDEMNIFY AND HOLD HARMLESS LOTUS SACRAMENTO CORP. ALL PARTICIPATING SPONSORS, THEIR RESPECTIVE AFFILIATES, DIRECTORS, OFFICERS, AGENTS, STAFF, ADMINISTRATORS, ASSIGNS FROM ANY AND ALL LIABILITY, LOSS, COST, DAMAGE, INJURY, OR DEATH, INCLUDING ATTORNEYS’ FEES ARISING OUT OF, RELATING TO OR IN CONNECTION WITH PARTICIPATING IN THE PROMOTION/CONTEST AND/OR ACCEPTING THE PRIZE. EMPLOYEES, THOSE DOMICILED WITH, AND THE IMMEDIATE FAMILIES OF EMPLOYEES OF LOTUS SACRAMENTO CORP. AND PARTICIPATING SPONSORS ARE INELIGIBLE. LOTUS SACRAMENTO AND PARTICIPATING SPONSORS RESERVE THE RIGHT TO USE WINNERS NAMES, VOICE AND IMAGE FOR PROMOTIONAL PURPOSES. A COMPLETE COPY OF THESE RULES ARE AVAILABLE AT LOTUS SACRAMENTO, 1442 ETHAN WAY, SUITE 101, SACRAMENTO, CALIFORNIA DURING NORMAL BUSINESS HOURS.